On this day in 1979, the game Trivial Pursuit was born. Two Canadian journalists Chris Haney and Scott Abbott were playing Scrabble when they discovered that some of the game’s pieces were missing. Undeterred, they decided to create their own game. It took two years to develop and market the game, but when it was released in 1981, it became wildly popular. In 1984 more than 20 million games were sold. 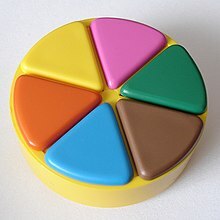 The object of Trivial Pursuit is to acquire six wedge-shaped colored pieces by correctly answering trivia questions in six different categories. Since the game’s release dozens of different editions of the game have been added, including theme-based versions, based on Star Trek, Lord of the Rings, The Beatles, and Disney. All versions of the game follow the same pattern which is based on moving around a wheel-shaped game board and answering trivia questions in six separate categories. In 2003 Trivial Pursuit was named to the “Games Hall of Fame” by Games magazine, and in 2008 Hasbro bought the full rights to the game for $80 million (1). The word trivia has its origins in Latin, from trivialis, meaning three (tri) roads (via) or “crossroads.” This probably explains the aspect of trivia being common or ordinary information, the kind of things that people would talk about when they met at the crossroads. A related word trivium has a more academic history. In Medieval education the trivium was the term used to represent the “three roads” or “three ways” to acquiring the first level of a classical education at university through the study of rhetoric, grammar, and logic. The trivium would then be followed by the quadrivium (“four ways”): arithmetic, geometry, music and astronomy. The fact that the trivium made up the basic level of education and the quadrivium the advanced, is further explanation for the modern meaning of trivia as “less important matters”(2).